PLAQUEMINE, La. 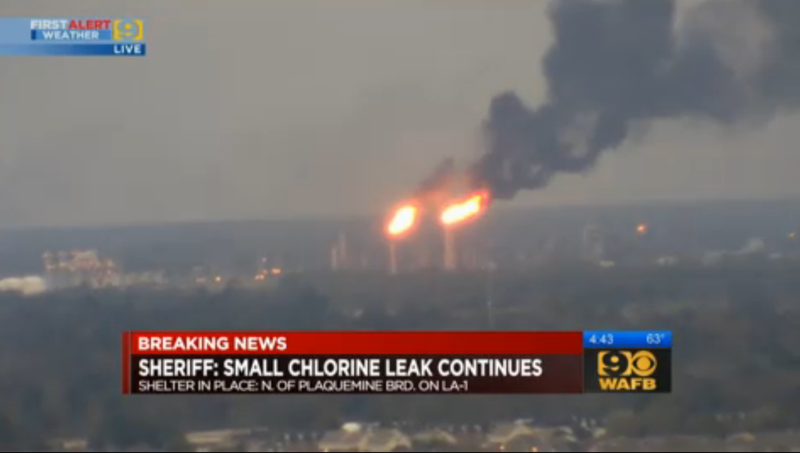 -- Three employees are being held for observation after a chlorine release at a DOW Chemical Plant near Baton Rouge on Friday afternoon, CBS affiliate WAFB reports. A small chlorine leak on the property of DOW Chemical in Plaquemine forced a shelter-in-place for certain residents of Iberville Parish. The leak was stopped just before 6 p.m. Friday, Iberville Parish Sheriff Brett Stassi reported. Around 7 p.m., Sheriff Stassi confirmed the shelter-in-place has been lifted. Around 7:15 p.m., Sheriff Stassi confirmed that the situation at the site has been contained and there is no detectable smell of chlorine. Officials said 16 non-essential employees from the facility drove themselves area hospitals asking to be evaluated. DOW spokesperson Stacey Chiasson said she did not know what medical complaints those people had. Non-essential employees were evacuated from the plant as soon as the incident started, around 3 p.m. Friday. Chiasson says all other employees at the DOW site have been accounted for and none of them sustained injuries. The incident happened when the facility lost power, Chiasson said. She said Olin Corporation, a tenant on the DOW site which produces chlorine, experienced a small chlorine leak. Power was restored to the facility around 5:15 p.m.
LA 1 was reopened around 6:30 p.m. River Road was briefly closed, but later reopened. “We have a lot of industry here, we are fortunate to have that, but with that comes these problems, but we’re going to continue to work with the chemical industry, with the chemical plants to make sure we keep the communication open and we know what’s going on,” Stassi said. Stassi says emergency sirens in the area were not activated because no evacuations were ordered. He says phone calls were made using the 911 system to residents who needed to stay indoors. The DOW plant had a recent increase in flaring due to maintenance for several weeks prior to this incident and officials urged people not to be alarmed by the large flames coming from the flares.